in 1bash change USE_ENVIRONMENTAL_VARIBLES from "NO" to "YES"
how can we add this command on bash file? This setting is not only for AMD ? Have you been using 2 ATX PSUs or one was server PSU like in my set up? I don't have quick access to new PSUs so swapping them gonna take about 5 days to one week , it's very strange how this error seems to appear in completely unpredictable timings. I also worked out strange thing that when I disconnect the PSUs from each other it seems more stable than with the rele connector synchronizing them , when they are connected it takes a couple of minutes to freeze and otherwise it can work for a couple of hours even with more then 8 cards( using 11 atm seems to be impossible for some reason to plug in all 12 without something crashing). I have been building new rigs and troubleshooting existing ones in a mine. I would try IAmNotAJeep's suggestion; I have also had dual joined PSUs cause problems before. I have seen many similar problems (even with 6 gpu rigs) and then also had them disappear when I remove all the trouble GPUs and make another rig out of them. This has been the most time effective way of resolving all GPU problems; however, it does have a high cost in regard to using additional components. Thanks fullzero for your reply. I am going to find parts and cables to add 2 molexes to my server PSU and try to use single PSU and see how that works out as now it seems okayish with 11 cards , just the 12th one causing lots of trouble with drivers and the system overall. Also as I have 11 P106-100 cards available and you can probably if you need connect to my rig to try and see what the problem in OC is , teamviewer or what do you need to use? Would highly appreciate you having a solution for this since these cards can run up to 25 MH/s and now all I can get from them is 21 which is 15% difference and since I was thinking of making over 5 of those rigs this makes huge impact on profitability. If you can somehow deal with OC issue on P106-100 I think me as well as other users using those cards wouldn't hesitate on making good donation for your work since this system is probably one of the best if not the best for Nvidia Cards atm. Watchdog restarts the mining process but GPU4 doesn't recover. Team viewer and miner freezes when I try to access the Guake terminal, but the rig is still accessible via SSH and seems like the RSS process also still works because the rig is not rebooted. I already replaced raiser, didn't help. I dropped OC down to ZERO both on GPU and Memory, didn't help. I raised POWER from 180 to 230, no effect on stability. or pull the bad card run it on a tester mobo that runs troubled cards. All my rigs are dual PSU and all of them worked fine. Just this one started to act up after 2 weeks. I removed all cards from one of the PSUs and the rig crashed anyway, at that point it was clear to me it must have something to do with the PSU connector. I replaced it and it's been running now for 2-3 days. Seems to me it's a common problem, looking at the recent posts of IAmNotAJeep. Does that mean I can setup a rig with all of p106-100 cards and connect monitor to the motherboard directly? In theory yes; although I haven't tested this myself. Although the P106_100's will also likely not OC. I really need 2x P106_100's to test. I tried to connect to ivoldemar's rig with them yesterday; but my connection was refused. I'll try again today. my p106*8 rig will be ready in 2 days, you can ssh to it to do some tests. please anyone got same issue? Been running 11 cards on h110 asrock and then tried to connect 12th one and everytime I do it Nvidia drivers seem to crash no matter what I do. It's not a hardware problem as I have tested this card in 11 cards set up and everything boots fine, just the 12th one seem to crash everything and I have to reflash the OS again to make it work. When I try with fresh OS and 12 cards its the same problem again, the nvidia-smi file isn't found and the claymore can't initialize CUDA drivers . Has anyone seen this before and maybe knows the way to deal with this? Maybe I need to correct something in 1bash to make it work but so far all my tries were a failure and the miner couldn't find drivers. UPD. Somehow managed to get all 12 cards working but in genoil instead of claymore , still have no idea what the problem was since I've done everything like swapping risers and cards before and this hasn't got me anywhere, but genoil gives lower hashrate then claymore, so does anyone know or can advice on how to make claymore work aat this set up? Yeah I know, all 5 are connected to the ATX PSU and risers+cards are powered from another PSU. I ran into an issue that I can't figure out how to fix. I've got 12 gpus on a TB250-BTC Pro, and all of them work fine, except the last one GPU12 (PCI:12:0:0) which doesn't seem to start an xserver instance on boot. Because it doesn't load xserver, the fan and power settings are unavailable for editing, so the card runs too hot and causes power throttling, and occasionally a reboot. Any idea how to fix that? I checked the /etc/X11/xorg.conf file and it looks fine from what I can tell (all display device settings are there and look the same). Tell me, when do you fix for P106 cards? I can not collect 40 farms already for 13 cards, because Does not work razgon on your assembly .... please give it 1 hour. I already threw you access to the rig on which there are 13 P106 cards. Access to you in private messages. okay nvOC 0018 has so many changes and alterations to it I can't follow them all. I can get nvOC 0017 to work and have been stick with it. I would prefer to run linux nvOC 0019 and have it as easy to set up as 0017 was. I will await nvOC 0019 as I have done nvOC 0018 four times four fails. A member requested these as an option so I added them. I don't use them; although I tend to stick to the main coins. It is possible they make a difference when mining some of the more obscure coins. pm me teamviewer info for a P106-100 rig and I will try to get it working. pm me teamviewer or ssh info for a P106-100 rig and I will try to get it working. My guess is you need more power for stable dual mining. 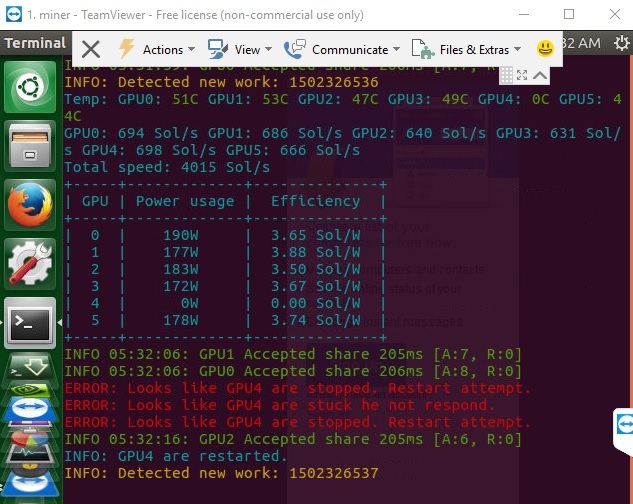 I recommend trying a powerlimit of 68 when dual mining with a 1050ti. I'm guessing the 12th is assigned an odd index variable by the system that the xorg.conf or other system file doesn't properly deal with. Last time I tried to connect it didn't work. I'll try again later today.